Photo Illustration courtesy of Ryan Hodson -- Ryan Hodson made this meme in response to being interviewed for this article. Photo Illustration courtesy of Ryan Hodson — Ryan Hodson made this meme in response to being interviewed for this article. The newest internet sensation sweeping the web is the meme phenomenon. They are posted, shared, liked and generated to fit any humorous incident or community culture. Pronounced “mheemz,” memes are pictures that have any number of sentences or words written across them. They range from pictures of celebrities to stick figure drawings. From vulgar or rude to wholesome clean fun, memes are everywhere online, but college campuses are taking this trend and making it more popular, thanks to social media. The Facebook page has a variety of campus-related memes, from chapel memes to memes about CBU myths or common culture, they are shared among students and enjoyed. The meme Facebook page is monitored and kept to clean, campus-approved humor. The administrator of the page, whose identity is unknown, regulates the page and makes it clear that those adding to the page may not violate the rules or their posts will be removed. Part of the driving force behind the meme sensation is a sense of community and popularity of the memes shared online. 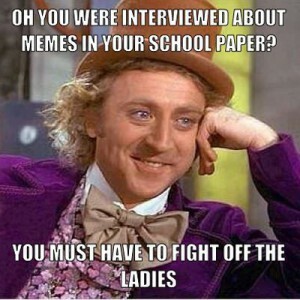 The online community creates college memes at a fast rate, it is hard to say when the phenomenon began and just how they started, as no one is tracking the history of the sensation. One particular pattern often used in memes is the use of slang words and language. The main attraction to memes is the images that are used, they are generally unrelated to what the meme has written along with the photo. “I loved making my meme be- cause you can see how people agree with you and enjoy [it] based on ‘likes,’” Justin Park, junior, said. Knowing that a meme is funny and shared within a community only strengthens the fanbase of memes. “Memes are a hilarious internet phenomenon,” Ryan Hodson, junior, said. However, not all students are giving the meme page a good review, some students feel the memes are just not funny or sarcastic enough. The page administrator has even posted that the memes on the campus page are not that funny, suggesting that uses create more clever and clean memes. “I’ve seen ‘Cal Baptist Memes’ and I’m not very impressed by them,” Mark Gomez, senior, said. Hodson enjoys making memes and has made several, he uses a meme generator app on his iPhone and admits that it is addictive. When asked what he thought about the “Cal Baptist Meme” page, he admitted it left something to be de- sired but that he still gets a laugh out of them. “It is hit and miss but some have really made me laugh,” Hodson said. “TROLOLOLOL,” Matt Chong, junior said. Chong’s “TROLOLOLOL” comment is considered to be meme knowledge for those in the meme- making community. “The ‘TROLOLOLOL’ originated from a a singing Russian man that gained huge popularity on YouTube and is often called the ‘Russian Rick Roll.’ The phrase ‘TROLOLOLOL’ then became the base of ‘laughing’ in the meme/ trolling world,” Chong said. Aside from any negative connotations, memes can be very complimentary, so much so that there are several that shine a nice light on several CBU faculty members. This is refreshing when many other schools portray negative faculty comments on college memes. “I love CBU and its students. Anything I can do to positively impact it is both a pleasure and a privilege,” Jeff Mooney, Associate professor of Old Testament, said. Students even use memes in unexpected ways. “I love memes! I just used some in a presentation for class and it makes it more interesting, especially if everyone knows what you are presenting on,” Anna Hart, junior, said. College memes are an active part of what makes college culture fun and unique. Regardless of their topics, they give students a way to laugh at their stresses and college’s unique experience.